This Es Canar Map shows popular Es Canar Attractions, places of Tourist interest &Transport locations Click the name in the right column below to highlight the location on the map. Es Canar is a fairly large resort, 25km northeast of Ibiza town. As it has developed into a resort from a fishing village it has managed to retain much of its original character. The resort has mainly developed in the area behind the small harbour which is situated on the southern headland, and also on the opposite headland Punta de ses Calderes where there are two large hotels and an apartment complex overlooking Es Canar bay. The central section backing the beach is relatively undeveloped. Es Canar is a a colourful charm with the white buildings contrasting with the deep blue seas, the dark green pine forests, the pale blue sky and pale yellow sands. There’s a good selection of bustling bars, cafes and restaurants, particularly on the seafront, but Nightlife is relaxed in Es Cana. The occasional local fiestas add a colourful flare to the resort. One event that must be visited is the local ‘hippy market’ craft fair, held on Wednesdays only a short walk south from the harbour. The smaller Cala Nova beach is at the end of the resort and can be reached by a coastal path. There are some spectacular walks along the coast either north or south. Try the coastal path to Santa Eulària for spectacular views of small coves and secluded beaches. Depending on your energy you can either walk back or catch the local bus. The fortified village of Balafi is just 15km from Es Canar and is worth a visit. A trip to the capital, Ibiza Town, is easy and 'a must' for shoppers and those who like the more outrageous things in life. There are 4 ways to travel to Es Canar from the airport. The beach at Cala Nova is 800 metres north of Es Canar beach and can be reached via a pleasant walk along the footpath around two headlands with the ses pedrisses bay between them. Although the water is quiet shallow with a sandy bottom, lovely for the kiddies to paddle in. In certain weather conditions Cala Nova beach can have strong undercurrents which sometimes bring out the red flag so check the colour of the flag before swimming. Cala Llenya beach is about an hours walk from Es Canar beach. You will pass several very picturesque stony coves, ideal if you want a bit of pease and quiet or better snorkeling than the sandy beaches.. The beach has fine very pale golden sand, with water sport facilities of windsurfing & pedaloes and is 200 metres long and 60 metres wide at the southern end. The central & northern end section the beach is narrower. At both ends of the beach are rocky areas ideal for the snorkeling enthusiast. The beach is backed with fir tree covered hills some of the trees coming right down to the beach giving a dramatic beautiful look. Like other beaches in this area the beach has a gentle slope with shallow water for some distance out, ideal for kids to play in the water. The beach has very good water sports. with pedaloes and a scuba diving and surfing school . Cala s'Argamass is a smaller beach located just east of Cala Martina beach with a length of 150 metres and width of 20 metres of fine Golden Sand. Cala Pada beach is a narrow, only 15 metres wide by 200 metres in length, consisting mainly of fine Golden Sand. Cala Mastella beach is a small beach of fine Golden Sand, only 50 metres long and just under 20 metres wide. It is located very close to Llenya Cove and the Can Jordi Housing Estate . The cove is surrounded by pine woods and there are a few buildings. The route to the beach is well signposted. At the southern end of Es Canar beach is a small harbour with fishermen's boat houses and the harbour has a marina appearance. Water sports. are available, especially in high season and there is a ferry service to other beaches Santa Eularia, and Ibiza. There is a Beach Hopping Ferry service which visits some of the beaches, Formentera, Santa Eularia, and Ibiza. The ferry in Es Canar operates from the jetty in front of the Jacaranda Bar just to the south of the harbour. The very famous hippy market comes to Es Canar every Wednesday during April to October. The hippy market is well known all over Ibiza and started in 1973 with only 6 stands. Now it has over 400 and you can hardly move for bustling tourists. The locals tend to visit early or late avoiding the noon early afternoon the busiest time. You can buy virtually anything at the hippy market but keep an eye out for Ibicencan craft work, glassware and leatherwear. The Hippy Market is located at the Punta Aribi resort a short walk, 750 metres along the main road south from Es Canar harbour. Punta Aribi resort lies to the left of the road. You will pass the Punta Aribi hotel on the way to the resort which is 300 metres further on. There are no Banks in Es Canar, hotels & apartments will change travelers checks, take your passport for identity check. There is plenty going on here after dark, particularly on the seafront and on the main road to Santa Eularia You will find bars or cafes suitable for for a relaxed drink or some provide Sports coverage for the football enthusiast other load music, karaoke or quiz nights. Es Canar is going to offer you some perfect nights out. Just don't expect a lot of nightclubs or gourmet restaurants. But there is a nightclub the Kancela. If you are wanting to go to Ibiza's famous super clubs you have a limited Disco Bus Service to Santa Eularia then change for eivissa (Ibiza town) where you can change again if required for the other clubs. The Kancela can become crowded when there is a gig on. There's a good choice of bars, cafes and restaurants on Es Canar seafront and around the town square. Ibiza Island specialities include sofrit pages: potatoes, meat and red peppers stewed in olive oil. Most restaurants and cafe provide English cuisine and either local or international fare. Because of the fabulous summer Mediterranean climate most establishments have terraces so that you can eat outside and enjoy the weather. The Do Drop Inn has a large outside terrace for those wanting fresh air, and great sky TV coverage of sports and English soaps. There is a large swimming pool outside at the back. The Es Cana fast food cafe is located in an enviable position just where the main road meats the beach. The fairly large restaurant with indoor seating and outdoor terraces has beautiful vies of the beach, the two headlands and the offshore rocky island, Isla des Canar. Freddy and Julie's English Bar is said to be the friendliest bar in Es Cana. Check it out & see for yourselves. The Jacaranda Bar probably the best position for a bar & restaurant in Es Canar. Just next to the ferry jetty and marina and with magnificent views of the beach, bay and the northern coastline. Great selection of cocktails, Ice cream and snacks. La Perla family run restaurant offering both a full extensive meal menu with both Spanish & English cuisines or snacks including tapas. La Perla has both an inside restaurant and a very large external terrace. Fresh sea food is a specialty of the restaurant. 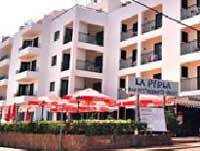 The Es Canar Bus stop is located on the main road from & Sant Carles around 100 metres from Es Canar beach on the opposite side of the road from the La Perla hotel, Mar y Herta hotel and the Apache cafe bar see photograph. The bus stop may be in the Car park alongside the road. A Car park, taxi rank and tourist information kiosk are located very near the bus stop.